Experience the healing properties of the InfraMat™ Full Mat with jade, tourmaline, and amethyst. Healthy Line’s heating pads and mats differ from typical heating pads because the makers of Healthy Line heating pads combine relaxing heat energy with the remarkable properties of precious stones. This unique and high-end best-seller is made with thirty jade stones, thirty tourmaline stones, and several pounds of amethyst stones. The mat is ideal for full-body therapy and should be chosen for a superior, whole-body result. Each stone used in the making of this mat produces its own healing benefits, and each stone’s unique properties work together to increase the therapeutic advantages of the mat. Jade is the most efficient gemstone in terms of heat absorption. Accordingly, the jade stones provide a relaxing warmth that immediately soothes acute aches and pains. Jade improves the immune system and is helpful for improving kidney ailments and stomach pain when used over time. When heated, jade produces negative ions, which optimize cell metabolism and cell repair. Jade’s energy is also said to promote good luck and the forming of close friendships. Tourmaline is a semiprecious mineral that increases the potency of negative ions produced by the jade. Tourmaline is well known for expelling waste from the body, detoxifying the bloodstream, and aiding in fat loss. In addition, tourmaline reduces retention of water and increases blood circulation. The crushed amethysts in the mat further intensify the healing properties of jade and tourmaline. These stones also assist healing deeper within the body. The infrared rays produced by amethysts can penetrate up to six inches into the human body. Amethysts can increase your overall energy level and detoxify the body from drug and alcohol use, so the mat may be beneficial in treating addiction. Amethysts also help relieve joint pain and can improve memory and promote weight control. 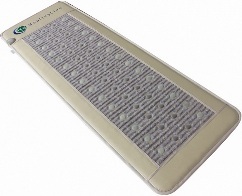 All stones in this mat provide a convenient way to increase negative ions in the body. These negative ions improve metabolism and immune system function and can even slow calcium and collagen breakdown. This mat may reduce stress by increasing levels of melatonin and serotonin, which are natural chemicals in the brain that promote well-being and restful feelings. The pad measures 180 cm by 60 cm and is rated as having 185 watts of power. The heating pad comes complete with an LED display controller and a remote for your convenience.